The success of a startup evolves often around availability of capital. While preferably the customers provide for the most important funding, in many case other funding sources are required. Fortunately, there are plenty of sources for early stage funding, albeit that competition to obtain them is large. 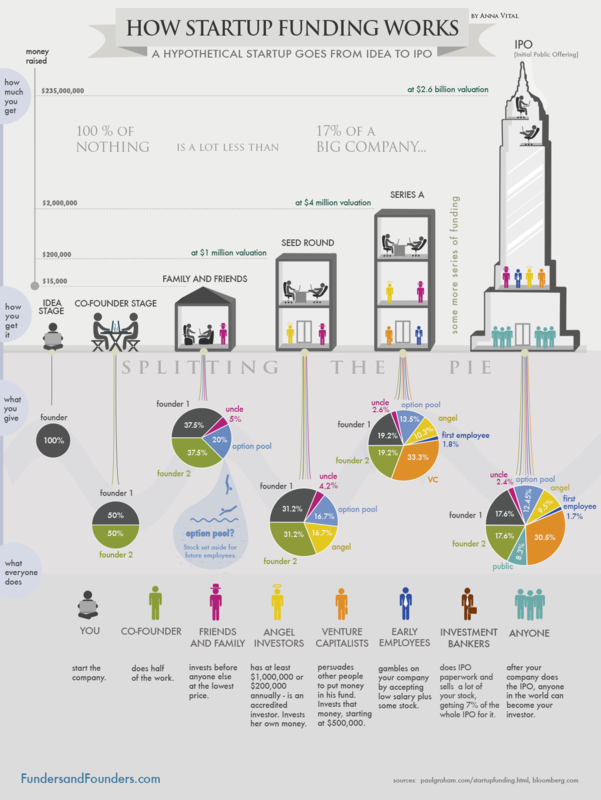 A nice visual overview of early stage funding is found at visual.ly. One of the obstacles in obtaining financing at an early stage, is the fact that much help, from financial advisors and lawyers, is costly while the success at getting funded is not certain. Since so many early stage companies decide to, a large knowledge disparity exists between startups and investors. This results in a lengthy (and often still costly) negotiation process for investment. The templates provided will enable you to do most negotiation in the term sheet phase, as long as you agree on using the provided documentation templates. This will speed up negotiation and limit legal costs. We do recommend that parties have the final version of documents checked by at least lawyer, but preferably each party for themselves. After your business will acquire it’s first customers or when plans are made to attract an external financier, it might be wise to incorporate your company into a BV. The conversion from an informal business into a legal entity always has several legal and fiscal consequences. Please read our blog post about that here. We have uploaded document templates with a very simple structure and conditions. Nevertheless, these conditions prepare your company for an external investor in the future. So if you want to incorporate your company, you can find the necessary documents here. For the first funding beyond Founders, Friends and Family, Informal Investors or Business Angels are a very important source for early stage ventures. The level of experience of Informal Investors varies much and as a consequence, so do the deal terms under which financing is provided. We have uploaded document templates with a relatively simple structure and conditions, which we have seen to work out between startups and angel investors. We expect these deal terms to be at their best in deals up to € 250k per investor., although there is no real limit to its use. Please read the relevant blog post from December 2013. April 2015, we have added a model for convertible loan agreements, besides the option to use ordinary shares or preferred shares. Venture Capital is, as the more risk taking category of Private Equity, still a broad range of parties with different backgrounds and goals. Venture Capital funding usually invests in early stage companies, after several risks have been eliminated, but profitability is still not achieved. In the Netherlands most investors can be found at the Nederlandse Vereninging van participatiemaatschappijen (NVP). On a european scale, most Venture Capital firms are member of the European Veture Capital Association (EVCA). The Capital Waters documentation is a standardized set of documents designed for seed or series A investments in the Netherlands, ranging broadly speaking from € 100 k to € 1 mio, for any of these types of VC’s, although we expect each party to have it’s own specific conditions. Download the preferred share, regular share or convertible loan model documents here.